Made it to Austin last night in the dark, after a few too many hours on the road from Snyder through the Lueders basin down 183 and into the traffic that encircles Austin at rush hour. Fortunately the margaritas at Guero's effectively washed off the road dust, and we awoke in the Hotel San Jose this morning with renewed vigor for the day’s agenda. Austin Texas, capital of the state and county seat of Travis County. Founded in 1830 on the banks of a river named the Colorado. Residents of Austin are known as Austinites, and have adopted the motto, “keep Austin Weird”. Austin also became known as the City of the “violet crown” for the wintertime violet glow of color across the hills just after sunset. My earliest memories of Austin was as the town where Davy Crockett sent for help during the battle of the Alamo and they never came. 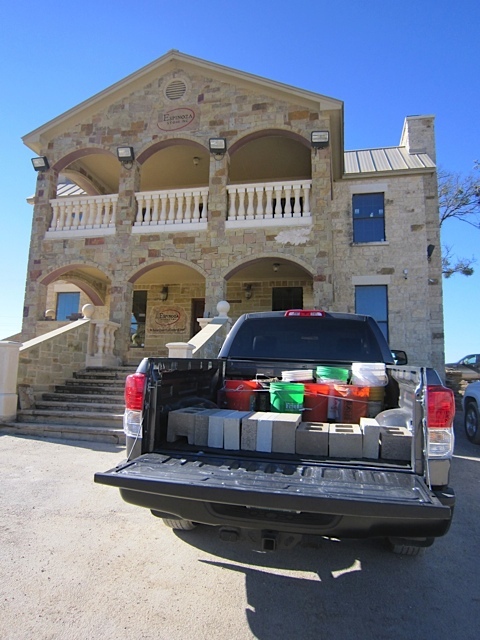 Austin is backed up to the Balcones Escarpment, on the eastern edge of Texas Hill Country - twenty five counties of Central Texas, including the LLano Uplfit - thin topsoils resting on beds of limestone and batholiths of granite. 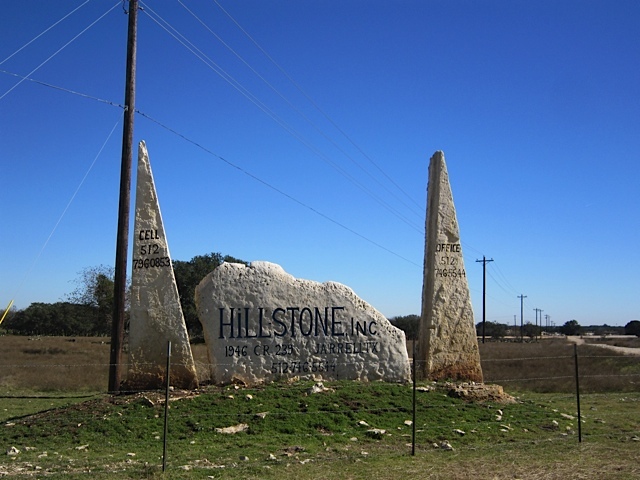 Hill country limestone, softer and lighter colored than Lueders limestone - white, yellow, cream, butterscotch - and once you get an hour north of Austin, around Georgetown and Florence it seems to be everywhere. Cattle on the surface, calcium carbonate below. Dig a hole and you get limestone. Dig a big hole and you get a limestone quarry. Get a permit and you’re in the limestone business. 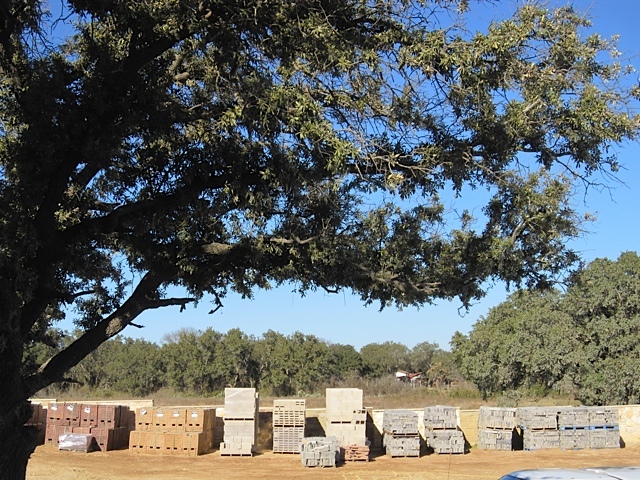 Aguado Stone, Salado Stone, Espinosa Stone, Apache Stone, Cobra Stone, Quality Stone, HIllstone, Culp and Son - all of them within ten miles of one another, working the same strata and with the same go-to-market formula: extract four-ton blocks out of the ground, saw the blocks into 4” thick slabs, saw the slabs into 4” wide strips, chop the strips into face brick, and stack them on a pallet; build a showroom of limestone chop block, hire some women to work behind the counter, and a couple of salesmen to work in front of the counter. They weren’t all exactly the same size. Twenty workers at some, sixty at others. At Cobra and Espinosa, the showrooms were larger and the products more varied. They polish and carve at Cobra. At Espinosa they dress limestone imported from Lueders and they quarry and dress a local sandstone bed. Espinosa also recently expanded operations and became part of a sister company called Capitol Products. We drove five miles to Capitol - a spanking new limestone processing and, yes, concrete block plant making CMU out of limestone sand and gravel. Even their gray precision block looked good. The dyed blocks looked really good. Bobby Laird, salesmen, told me they’d been in business for three months. “It’s hard to break into the block business”. They run one, four-at-a-time Columbia, capable of 5000 blocks per ten hour shift. They don’t have cure rooms, just let the blocks sit on the floor for a week. Bobby sells a dyed, split face block for $2.35 each, a buck more for a honed face. People don’t care about green, but if he sells in Austin (keep Austin weird), they add 6% recycled content. Bobby didn’t have the energy to get out of his chair, but did give me permission to walk around. There’s something special about a brand spanking new plant. It’s clean, for one thing, and organized. The walls and door jambs haven’t been bashed up by forklifts, the debris piles are small and under control; the watering system and filter ponds are better designed. Out back, behind the block plant, they were running a big Cobra band saw, sawing two-inch slabs. Watching the water pour off the blade in the late afternoon sun, I thought I saw the violet crown.